You can sync only one catalog between Lightroom CC on your desktop and Lightroom for mobile. Beginning with Lightroom CC 2015.8/Lightroom 6.8, a provision to recover lost or accidentally deleted synced catalog has been added. Now, when you sync a new catalog, Lightroom CC automatically downloads all your synced Lightroom mobile photos to the new Lightroom catalog. In the earlier Lightroom versions — if you accidentally deleted your Lightroom mobile data while syncing another catalog — retrieving the lost data was difficult in such cases. Choose File > Open Catalog. In the Open Catalog dialog box, specify the new catalog file and then click Open. When you open a different catalog, Lightroom closes the current catalog and relaunches. When prompted, click Relaunch to close the current catalog and relaunch Lightroom. After Lightroom opens another catalog, click the Activity Center at the upper-left corner of the screen and start Sync with Lightroom mobile. This step is not required if sync is already 'on'. The following dialog box appears. Click Yes, sync this catalog instead. Lightroom desktop now begins downloading all your synced mobile photos to the new Lightroom catalog. Previously synced Lightroom Photos and collections in Lightroom for mobile. Catalog panel in Lightroom desktop; all the synced photos in the 'Lightroom Photos' view in Lightroom for mobile (left) are added to 'All Synced Photographs' in the Catalog panel. 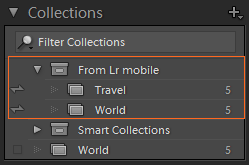 Collections panel in Lightroom desktop; all the synced collections are downloaded under 'From Lightroom mobile' collection set in the Collections panel. 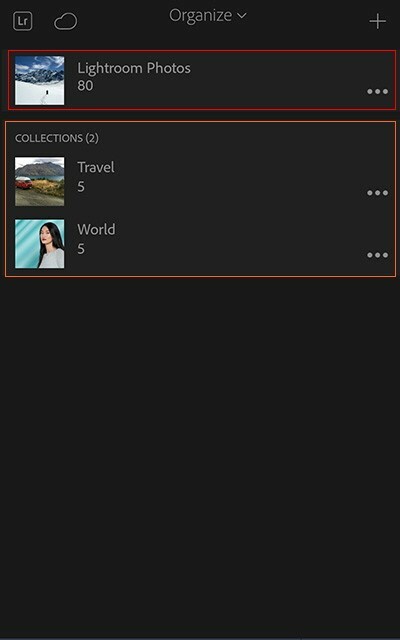 All the synced collections are downloaded under From Lightroom mobile collection set in the Collections panel. All the synced photos in Lightroom Photos view in Lightroom for mobile/All Photos view in Lightroom on the web are added to All Synced Photographs in the Catalog panel. Since Lightroom syncs only Smart Previews to Lightroom for mobile, for those images that were synced from Lightroom desktop app, Smart previews are downloaded and Originals are mapped if located at the same location from where the photo was first synced. The workflow to sync a different desktop catalog has been updated in Lightroom CC 2015.8/Lightroom 6.8. A provision to recover lost or accidentally deleted synced catalog has been added. You can sync only one catalog between Lightroom CC on your desktop and Lightroom for mobile. 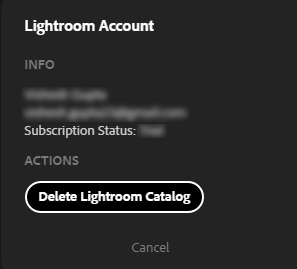 Therefore, if you want to sync another Lightroom catalog in place of the current catalog, you must delete the current catalog of synced photos. Deleting your current catalog means that any synced photos from Lightroom CC on your desktop and mobile devices will no longer be visible on your phone or tablet, or from a browser, until you start resyncing photos from a different desktop catalog. The original photos you have synced from Lightroom CC on your desktop will not be deleted from the local hard drive on your desktop computer. Original photos on your mobile device’s camera roll will also remain in the camera roll. In Lightroom CC 2015.7/Lightroom 6.7 and Lightroom CC 2015.6/Lightroom 6.6, if you want to change which desktop catalog you are syncing, you are now directed to https://lightroom.adobe.com to delete the current catalog of synced photos. Choose File > Open Catalog. In the Open Catalog dialog box, specify the catalog file and then click Open. After Lightroom opens another catalog, click the Activity Center at the upper-left corner of the screen and start Sync with Lightroom mobile. The following dialog box appears. Click Delete previously synced photos. You are now directed to Lightroom on the web. To proceed, follow the prompts to confirm your action.